'Bachelor in Paradise' Couple Caught Together ... We're Engaged! 'Bachelor in Paradise' Couple Caught Together ... We're Engaged!! "Bachelor in Paradise" stars Lace Morris and Grant Kemp totally got busted hanging out together 2 days before the show premiered -- a major violation -- but there's a good reason: THEY'RE GETTING MARRIED! Grant and Lace were poolside Sunday at a fancy apartment complex in Denver. Witnesses tell us they were flirty, and all over each other. We're told Grant flew there to visit Lace, who lives nearby. A source tells us Lace plans to move to L.A. to live with her firefighter fiance. All of this is great news for them, but a serious bummer for 'BiP' producers ... who expect the house guests to avoid all contact in public until after the season airs. The teaser promo showed 3 male hands holding engagement rings -- and according to our sources ... Grant is one of 'em. ABC refused to comment. Interesting outcome ... considering Lace hooked up with bad boy Chad Johnson in the premiere. So, she dodged "Hurricane Chad" and got nice guy Grant instead. 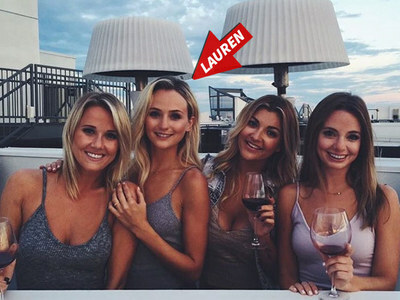 'Bachelor' Contestant Lauren B. -- Engagement Ring On ... Winner Winner?